In accordance with some embodiments, a computer-implemented method is performed at a portable electronic device with a touch screen display. The method includes: displaying graphics and an insertion marker at a first location in the graphics on the touch screen display; detecting a finger contact with the touch screen display; and in response to the detected finger contact, expanding the insertion marker from a first size to a second size on the touch screen display and expanding a portion of the graphics on the touch screen display from an original size to an expanded size. The method further includes detecting movement of the finger contact on the touch screen display and moving the expanded insertion marker in accordance with the detected movement of the finger contact from the first location to a second location in the graphics. The disclosed embodiments relate generally to portable electronic devices, and more particularly, to adjusting an insertion point marker on a portable electronic device. Most portable electronic devices include applications that use text entry. Such applications may include instant messaging applications, email applications, and word processing applications, as well as other applications with text input. Because the screens on portable electronic devices are relatively small, the text and corresponding text entry tools are relatively small as well. Typically, a small cursor is displayed to indicate where text will be inserted. To date, portable electronic devices have not provided an easy, efficient way to position a cursor or other insertion point marker when a user is entering text. Accordingly, there is a need for portable multifunction devices with more transparent and intuitive user interfaces for positioning an insertion point marker (e.g., a cursor) that are easy to use, configure, and/or adapt. Such interfaces increase the effectiveness, efficiency and user satisfaction with portable multifunction devices. The above deficiencies and other problems associated with user interfaces for portable devices are reduced or eliminated by the disclosed portable multifunction device. In some embodiments, the device has a touch-sensitive display (also known as a "touch screen") with a graphical user interface (GUI), one or more processors, memory and one or more modules, programs or sets of instructions stored in the memory for performing multiple functions. In some embodiments, the user interacts with the GUI primarily through finger contacts and gestures on the touch-sensitive display. In some embodiments, the functions may include telephoning, video conferencing, e-mailing, instant messaging, blogging, digital photographing, digital videoing, web browsing, digital music playing, and/or digital video playing. Instructions for performing these functions may be included in a computer program product configured for execution by one or more processors. In accordance with some embodiments, a graphical user interface on a portable electronic device with a touch screen display includes an insertion marker and graphics. In response to detecting a finger contact with the touch screen display, the insertion marker is expanded from a first size to a second size, and a portion of the graphics is expanded; and in response to detecting movement of the finger contact on the touch screen display, the expanded insertion marker is moved in accordance with the detected movement of the finger contact from a first location in the graphics to a second location in the graphics. In accordance with some embodiments, a portable electronic device includes a touch screen display; one or more processors; memory; and one or more programs. The one or more programs are stored in the memory and configured to be executed by the one or more processors. The programs include: instructions for displaying graphics and an insertion marker at a first location in the graphics on the touch screen display; instructions for detecting a finger contact with the touch screen display; instructions for expanding the insertion marker from a first size to a second size on the touch screen display in response to the detected finger contact; instructions for expanding a portion of the graphics on the touch screen display from an original size to an expanded size in response to the detected finger contact; instructions for detecting movement of the finger contact on the touch screen display; and instructions for moving the expanded insertion marker in accordance with the detected movement of the finger contact from the first location to a second location in the graphics. In accordance with some embodiments, a computer readable storage medium stores one or more programs. The one or more programs include instructions, which when executed by a portable electronic device with a touch screen display, cause the device to: display graphics and an insertion marker at a first location in the graphics on the touch screen display; detect a finger contact with the touch screen display; expand the insertion marker from a first size to a second size on the touch screen display in response to the detected finger contact; expand a portion of the graphics on the touch screen display from an original size to an expanded size in response to the detected finger contact; detect movement of the finger contact on the touch screen display; and move the expanded insertion marker in accordance with the detected movement of the finger contact from the first location to a second location in the graphics. In accordance with some embodiments, a portable electronic device with a touch screen display includes: means for displaying graphics and an insertion marker at a first location in the graphics on the touch screen display; means for detecting a finger contact with the touch screen display; means for expanding the insertion marker from a first size to a second size on the touch screen display in response to the detected finger contact; means for expanding a portion of the graphics on the touch screen display from an original size to an expanded size in response to the detected finger contact; means for detecting movement of the finger contact on the touch screen display; and means for moving the expanded insertion marker in accordance with the detected movement of the finger contact from the first location to a second location in the graphics. Figures IA and IB are block diagrams illustrating portable multifunction devices with touch-sensitive displays in accordance with some embodiments. Figures 5A-5K illustrate an exemplary user interface for inputting text for an instant message in accordance with some embodiments. Figures 6A-6C illustrate an exemplary user interface for managing, displaying, and creating notes in accordance with some embodiments. Figure 7 is a flow diagram illustrating a process for displaying and using an insertion point magnifier in accordance with some embodiments. The user interfaces may include one or more soft keyboard embodiments. The soft keyboard embodiments may include standard (QWERTY) and/or non-standard configurations of symbols on the displayed icons of the keyboard, such as those described in U.S. Patent Applications No. 11/459,606 , "Keyboards For Portable Electronic Devices," filed July 24, 2006, and No. 11/459,615, "Touch Screen Keyboards For Portable Electronic Devices," filed July 24, 2006, the contents of which are hereby incorporated by reference. The keyboard embodiments may include a reduced number of icons (or soft keys) relative to the number of keys in existing physical keyboards, such as that for a typewriter. This may make it easier for users to select one or more icons in the keyboard, and thus, one or more corresponding symbols. The keyboard embodiments may be adaptive. For example, displayed icons may be modified in accordance with user actions, such as selecting one or more icons and/or one or more corresponding symbols. One or more applications on the portable device may utilize common and/or different keyboard embodiments. Thus, the keyboard embodiment used may be tailored to at least some of the applications. In some embodiments, one or more keyboard embodiments may be tailored to a respective user. For example, one or more keyboard embodiments may be tailored to a respective user based on a word usage history (lexicography, slang, individual usage) of the respective user. Some of the keyboard embodiments may be adjusted to reduce a probability of a user error when selecting one or more icons, and thus one or more symbols, when using the soft keyboard embodiments. Attention is now directed towards embodiments of the device. Figures IA and IB are block diagrams illustrating portable multifunction devices 100 with touch-sensitive displays 112 in accordance with some embodiments. The touch-sensitive display 112 is sometimes called a "touch screen" for convenience, and may also be known as or called a touch-sensitive display system. The device 100 may include a memory 102 (which may include one or more computer readable storage mediums), a memory controller 122, one or more processing units (CPU's) 120, a peripherals interface 118, RF circuitry 108, audio circuitry 110, a speaker 111, a microphone 113, an input/output (I/O) subsystem 106, other input or control devices 116, and an external port 124. The device 100 may include one or more optical sensors 164. These components may communicate over one or more communication buses or signal lines 103. It should be appreciated that the device 100 is only one example of a portable multifunction device 100, and that the device 100 may have more or fewer components than shown, may combine two or more components, or a may have a different configuration or arrangement of the components. The various components shown in Figures IA and IB may be implemented in hardware, software or a combination of both hardware and software, including one or more signal processing and/or application specific integrated circuits. The RF (radio frequency) circuitry 108 receives and sends RF signals, also called electromagnetic signals. The RF circuitry 108 converts electrical signals to/from electromagnetic signals and communicates with communications networks and other communications devices via the electromagnetic signals. The RF circuitry 108 may include well-known circuitry for performing these functions, including but not limited to an antenna system, an RF transceiver, one or more amplifiers, a tuner, one or more oscillators, a digital signal processor, a CODEC chipset, a subscriber identity module (SIM) card, memory, and so forth. The RF circuitry 108 may communicate with networks, such as the Internet, also referred to as the World Wide Web (WWW), an intranet and/or a wireless network, such as a cellular telephone network, a wireless local area network (LAN) and/or a metropolitan area network (MAN), and other devices by wireless communication. The wireless communication may use any of a plurality of communications standards, protocols and technologies, including but not limited to Global System for Mobile Communications (GSM), Enhanced Data GSM Environment (EDGE), high-speed downlink packet access (HSDPA), wideband code division multiple access (W-CDMA), code division multiple access (CDMA), time division multiple access (TDMA), Bluetooth, Wireless Fidelity (Wi-Fi) (e.g., IEEE 802.11a, IEEE 802.11b, IEEE 802.1 Ig and/or IEEE 802.1 In), voice over Internet Protocol (VoIP), Wi-MAX, a protocol for email (e.g., Internet message access protocol (IMAP) and/or post office protocol (POP)), instant messaging (e.g., extensible messaging and presence protocol (XMPP), Session Initiation Protocol for Instant Messaging and Presence Leveraging Extensions (SIMPLE), and/or Instant Messaging and Presence Service (IMPS)), and/or Short Message Service (SMS)), or any other suitable communication protocol, including communication protocols not yet developed as of the filing date of this document. The I/O subsystem 106 couples input/output peripherals on the device 100, such as the touch screen 112 and other input/control devices 116, to the peripherals interface 118. The I/O subsystem 106 may include a display controller 156 and one or more input controllers 160 for other input or control devices. The one or more input controllers 160 receive/send electrical signals from/to other input or control devices 116. The other input/control devices 116 may include physical buttons (e.g., push buttons, rocker buttons, etc. ), dials, slider switches, joysticks, click wheels, and so forth. In some alternate embodiments, input controller(s) 160 may be coupled to any (or none) of the following: a keyboard, infrared port, USB port, and a pointer device such as a mouse. The one or more buttons (e.g., 208, Figure 2) may include an up/down button for volume control of the speaker 111 and/or the microphone 113. The one or more buttons may include a push button (e.g., 206, Figure 2). A quick press of the push button may disengage a lock of the touch screen 112 or begin a process that uses gestures on the touch screen to unlock the device, as described in U.S. Patent Application No. 11/322,549 , "Unlocking a Device by Performing Gestures on an Unlock Image," filed December 23, 2005, which is hereby incorporated by reference. A longer press of the push button (e.g., 206) may turn power to the device 100 on or off. The user may be able to customize a functionality of one or more of the buttons. The touch screen 112 is used to implement virtual or soft buttons and one or more soft keyboards. A touch-sensitive display in some embodiments of the touch screen 112 may be analogous to the multi-touch sensitive tablets described in the following U.S. Patents: 6,323,846 (Westerman et al ), 6,570,557 (Westerman et al ), and/or 6,677,932 (Westerman ), and/or U.S. Patent Publication 2002/0015024A1 , each of which is hereby incorporated by reference. However, a touch screen 112 displays visual output from the portable device 100, whereas touch sensitive tablets do not provide visual output. The device 100 may also include one or more optical sensors 164. Figures IA and IB show an optical sensor coupled to an optical sensor controller 158 in I/O subsystem 106. The optical sensor 164 may include charge-coupled device (CCD) or complementary metal-oxide semiconductor (CMOS) phototransistors. The optical sensor 164 receives light from the environment, projected through one or more lens, and converts the light to data representing an image. In conjunction with an imaging module 143 (also called a camera module), the optical sensor 164 may capture still images or video. In some embodiments, an optical sensor is located on the back of the device 100, opposite the touch screen display 112 on the front of the device, so that the touch screen display may be used as a viewfmder for either still and/or video image acquisition. In some embodiments, an optical sensor is located on the front of the device so that the user's image may be obtained for videoconferencing while the user views the other video conference participants on the touch screen display. In some embodiments, the position of the optical sensor 164 can be changed by the user (e.g., by rotating the lens and the sensor in the device housing) so that a single optical sensor 164 may be used along with the touch screen display for both video conferencing and still and/or video image acquisition. The device 100 may also include one or more proximity sensors 166. Figures IA and IB show a proximity sensor 166 coupled to the peripherals interface 118. Alternately, the proximity sensor 166 may be coupled to an input controller 160 in the I/O subsystem 106. The proximity sensor 166 may perform as described in U.S. Patent Application Nos. 11/241,839 , "Proximity Detector In Handheld Device," filed September 30, 2005; 11/240,788 , "Proximity Detector In Handheld Device," filed September 30, 2005; Serial No. to be determined, filed January 7, 2007, "Using Ambient Light Sensor To Augment Proximity Sensor Output," attorney docket no. 04860. P485 IUSl; Serial No. to be determined, filed October 24, 2006, "Automated Response To And Sensing Of User Activity In Portable Devices," attorney docket no. 04860.P4293; and Serial No. to be determined, filed December 12, 2006, "Methods And Systems For Automatic Configuration Of Peripherals," attorney docket no. 04860.P4634, which are hereby incorporated by reference. In some embodiments, the proximity sensor turns off and disables the touch screen 112 when the multifunction device is placed near the user's ear (e.g., when the user is making a phone call). In some embodiments, the proximity sensor keeps the screen off when the device is in the user's pocket, purse, or other dark area to prevent unnecessary battery drainage when the device is a locked state. The device 100 may also include one or more accelerometers 168. Figures IA and IB show an accelerometer 168 coupled to the peripherals interface 118. Alternately, the accelerometer 168 may be coupled to an input controller 160 in the I/O subsystem 106. The accelerometer 168 may perform as described in U.S. Patent Publication No. 20050190059 , "Acceleration-based Theft Detection System for Portable Electronic Devices," and U.S. Patent Publication No. 20060017692 , "Methods And Apparatuses For Operating A Portable Device Based On An Accelerometer," both of which are which are incorporated herein by reference. In some embodiments, information is displayed on the touch screen display in a portrait view or a landscape view based on an analysis of data received from the one or more accelerometers. The operating system 126 (e.g., Darwin, RTXC, LINUX, UNIX, OS X, WINDOWS, or an embedded operating system such as Vx Works) includes various software components and/or drivers for controlling and managing general system tasks (e.g., memory management, storage device control, power management, etc.) and facilitates communication between various hardware and software components. The graphics module 132 includes various known software components for rendering and displaying graphics on the touch screen 112, including components for changing the intensity of graphics that are displayed. As used herein, the term "graphics" includes any object that can be displayed to a user, including without limitation text, web pages, icons (such as user-interface objects including soft keys), digital images, videos, animations and the like. An animation in this context is a display of a sequence of images that gives the appearance of movement, and informs the user of an action that has been performed (such as moving an email message to a folder). In this context, a respective animation that confirms an action by the user of the device typically takes a predefined, finite amount of time, such as an amount of time between 0.2 and 1.0 seconds, or between 0.5 and 2.0 seconds, depending on the context. In conjunction with RF circuitry 108, touch screen 112, display controller 156, contact module 130, graphics module 132, and text input module 134, the instant messaging module 141 may be used to enter a sequence of characters corresponding to an instant message, to modify previously entered characters, to transmit a respective instant message (for example, using a Short Message Service (SMS) or Multimedia Message Service (MMS) protocol for telephony-based instant messages or using XMPP, SIMPLE, or IMPS for Internet-based instant messages), to receive instant messages and to view received instant messages. In some embodiments, transmitted and/or received instant messages may include graphics, photos, audio files, video files and/or other attachments as are supported in a MMS and/or an Enhanced Messaging Service (EMS). As used herein, "instant messaging" refers to both telephony-based messages (e.g., messages sent using SMS or MMS) and Internet-based messages (e.g., messages sent using XMPP, SIMPLE, or IMPS). Embodiments of user interfaces and associated processes using instant messaging module 141 are described further below. Each of the above identified modules and applications correspond to a set of instructions for performing one or more functions described above. These modules (i.e., sets of instructions) need not be implemented as separate software programs, procedures or modules, and thus various subsets of these modules may be combined or otherwise re-arranged in various embodiments. For example, video player module 145 may be combined with music player module 146 into a single module (e.g., video and music player module 152, Figure IB). In some embodiments, memory 102 may store a subset of the modules and data structures identified above. Furthermore, memory 102 may store additional modules and data structures not described above. In some embodiments, the device detects contact with the touch-sensitive display (e.g., a user's finger making contact on or near the unlock image 302) while the device is in a user-interface lock state. The device moves the unlock image 302 in accordance with the contact. The device transitions to a user-interface unlock state if the detected contact corresponds to a predefined gesture, such as moving the unlock image across channel 306. Conversely, the device maintains the user-interface lock state if the detected contact does not correspond to the predefined gesture. As noted above, processes that use gestures on the touch screen to unlock the device are described in U.S. Patent Applications No. 11/322,549 , "Unlocking A Device By Performing Gestures On An Unlock Image," filed December 23, 2005, and No. 11/322,550, "Indication Of Progress Towards Satisfaction Of A User Input Condition," filed December 23, 2005, which are hereby incorporated by reference. In some embodiments, UI 400A or 400B includes a gauge (not shown) that displays an updated account usage metric for an account associated with usage of the device (e.g., a cellular phone account), as described in U.S. Patent Application No. 11/322,552 , "Account Information Display For Portable Communication Device," filed December 23, 2005, which is hereby incorporated by reference. ● Vertical bar 630 that helps a user understand what portion of the list of instant messages in an IM conversation is being displayed. In some embodiments, a user can scroll through the message conversation (comprised of messages 604 and 606) by applying a vertical swipe gesture 610 to the area displaying the conversation. In some embodiments, a vertically downward gesture scrolls the conversation downward, thereby showing older messages in the conversation. In some embodiments, a vertically upward gesture scrolls the conversation upward, thereby showing newer, more recent messages in the conversation. In some embodiments, as noted above, the last message in the conversation (e.g., 606-2) is displayed in the list of instant messages 500 (e.g., 506-1). In some embodiments, keys in keyboards 616 (Figures 5 A, 5B, 5E-5K), 624 (Figure 5C), and/or 639 (Figure 5D) briefly change shade and/or color when touched/activated by a user to help the user learn to activate the desired keys. In some embodiments, vertical bar 630 is displayed temporarily after an object is detected on or near the touch screen display (e.g., a finger touch is detected anywhere on the list of instant messages). In some embodiments, the vertical bar 630 has a vertical position on top of the displayed portion of the list that corresponds to the vertical position in the list of the displayed portion of the list. In some embodiments, the vertical bar 630 has a vertical length that corresponds to the portion of the list being displayed. For example, in Figure 5 A, the vertical position of the vertical bar 630 indicates that the bottom of the list of messages is being displayed (which correspond to the most recent messages) and the vertical length of the vertical bar 630 indicates that roughly half of the messages in the conversation are being displayed. ● word suggestion area 622 that provides a list of possible words to complete the word fragment being typed by the user in text entry box 612. In some embodiments, the word suggestion area does not appear in UI 600B until after a predefined time delay (e.g., 2-3 seconds) in text being entered by the user. In some embodiments, the word suggestion area is not used or can be turned off by the user. ● Shift key 628 that when activated (e.g., by a finger tap on the icon) initiates display of yet another keyboard (e.g., 639, Figure 5D). In some embodiments, keeping the period key 631 near keyboard selector icon 626 reduces the distance that a user's finger needs to travel to enter the oft-used period. ● Another alternate keyboard 639, which may be made up primarily of symbols and punctuation, with frequently used punctuation keys (e.g., period key 631, comma key 633, question mark key 635, and exclamation point key 637) made larger than the other keys. ● New instant message 606-3 sent to the other party. In some embodiments, when the user activates a send key (e.g., either 614 or 620), an animation is performed by the device that visually moves the text in text entry box 612 from the text entry box 612 and appends it to the displayed string of user messages 606 to the other party. The black arrows in Figure 5E illustrate an animated formation of a quote bubble 606-3. In some embodiments, the size of the quote bubble scales with the size of the message. In some embodiments, a sound is also made when the message is sent, such as a droplet sound, to notify the user. ● Cancel icon 636 that when activated (e.g., by a finger tap on the icon) cancels the new instant message. ● Vertical bar 640 that helps a user understand how many items in the contact list that match the input in recipient input field 632 are being displayed. In some embodiments, list 638 contains contacts that match the input in recipient input field 632. For example, if the letter "v" is input, then contacts with either a first name or last name beginning with "v" are shown. If the letters "va" are input in field 632, then the list of contacts is narrowed to contacts with either a first name or last name beginning with "va", and so on until one of the displayed contacts is selected (e.g., by a tap on a contact entry in the list 638). In some embodiments, a user can scroll through the list 638 by applying a vertical swipe gesture 642 to the area displaying the list 638. In some embodiments, a vertically downward gesture scrolls the list downward and a vertically upward gesture scrolls the list upward. In some embodiments, vertical bar 640 is displayed temporarily after an object is detected on or near the touch screen display (e.g., a finger touch is detected anywhere on the list 638). In some embodiments, the vertical bar 640 has a vertical position on top of the displayed portion of the list that corresponds to the vertical position in the list of the displayed portion of the list. In some embodiments, the vertical bar 640 has a vertical length that corresponds to the portion of the list being displayed. ● Insertion marker 656 (e.g., a cursor, insertion bar, insertion point, or pointer). In some embodiments, activating suggested word 644 (e.g., by a finger tap on the suggested word) replaces the word being typed with the suggested word 644. In some embodiments, activating suggested word 646 (e.g., by a finger tap on the space bar) replaces the word being typed with the suggested word 646. In some embodiments, a user can set whether suggested words 644 and/or 646 are shown (e.g., by setting a user preference). In some embodiments, a letter is enlarged briefly after it is selected (e.g., "N" is enlarged briefly after typing "din" in Figure 5H) to provide visual feedback to the user. ● Expanded portion 650 of graphics that helps a user adjust the position of an expanded insertion marker 657 (sometimes called an "insertion point magnifier"), both of which are described in more detail below; and ● Expanded insertion marker 657. Figure 7 is a flow diagram illustrating process 700 for displaying and using an insertion point magnifier in accordance with some embodiments. In some embodiments, a finger contact 648-1 on or near the insertion marker 656 initiates display of insertion point magnifier 650 and expanded insertion marker 657-1. In some embodiments, as the finger contact is moved on the touch screen (e.g., to position 648- 2), there is corresponding motion of the expanded insertion marker (e.g., to 657-2) and the insertion point magnifier 650. Thus, the insertion point magnifier 650 provides an efficient way to position a cursor or other insertion marker using finger input on the touch screen. In some embodiments, the magnifier 650 remains visible and can be repositioned as long as continuous contact is maintained with the touch screen (e.g., from position 648-1 to position 648-2 within text input box 612). In some embodiments, a portable electronic device displays (702) graphics and an insertion marker (e.g., marker 656, Figure 5I) at a first location in the graphics on a touch screen display (e.g., Figure 5I). In some embodiments, the insertion marker 656 is a cursor, insertion bar, insertion point, or pointer. In some embodiments, the graphics include text (e.g., text in box 612, Figure 5I). A finger contact is detected (704) with the touch screen display (e.g., contact 648-1, Figure 5I). As shown in Figure 5I, the location of the finger contact may be proximate to the location of the insertion marker. 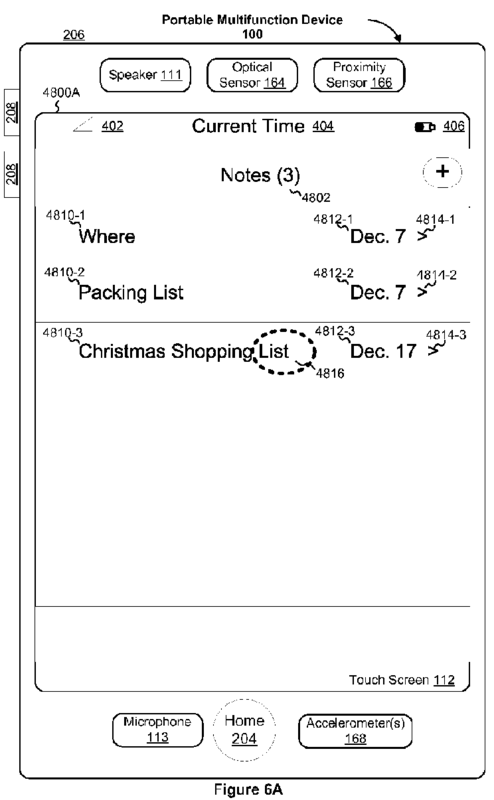 Alternately, the location of the finger contact may be anywhere within a text entry area (e.g., box 612, Figure 5I). In response to the detected finger contact, the insertion marker is expanded (706) from a first size (e.g., marker 656, Figure 5I) to a second size (e.g., marker 657-1, Figure 5J) on the touch screen display, and a portion (e.g., portion 650-1, Figure 5J) of the graphics on the touch screen display is expanded (708) from an original size to an expanded size. In some embodiments, the portion of the graphics that is expanded includes the insertion marker 657 and adjacent graphics. In some embodiments, after the insertion point and the portion of the graphics are expanded, graphics are displayed that include the insertion marker and adjacent graphics at the original size and at the expanded size. Movement of the finger contact is detected (710) on the touch screen display (e.g., from 648-1 to 648-2, Figure 5J). The expanded insertion marker is moved (712) in accordance with the detected movement of the finger contact from the first location (e.g., 657-1, Figure 5J) to a second location in the graphics (e.g., 657-2, Figure 5J). In some embodiments, the portion of the graphics that is expanded changes as the insertion marker moves from the first location to the second location (e.g., from 650-1 to 650-2, Figure 5J). In some embodiments, the portion of the graphics that is expanded is displayed in a predefined shape. For example, in some embodiments the portion (e.g., 650, Figure 5J) of the graphics that is expanded is displayed in a circle. In some embodiments, the expanded insertion marker 657 is within the circle. In some embodiments, the detected movement of the finger contact has a horizontal component on the touch screen display and a vertical component on the touch screen display. In some embodiments, moving the expanded insertion marker 657 in accordance with the detected movement of the finger contact includes moving the expanded insertion marker and the expanded portion of the graphics in accordance with only the horizontal component of motion of the finger contact (i.e., using the horizontal component but not the vertical component) when the finger contact moves outside a text entry area without breaking contact. For example, in Figure 5J, if the finger contact moves from 648-2 (inside the text entry area 612) to 648-3 (in the keyboard area), the expanded insertion point 657 and the expanded portion 650 of the graphics may move horizontally along the lower portion of the text entry area in accordance with the horizontal component of the movement from 648-2 to 648-3 (not shown). In some embodiments, moving the expanded insertion marker in accordance with the detected movement of the finger contact includes moving the expanded insertion marker in a first area of the touch screen that includes characters entered using a soft keyboard (e.g., text box 612, Figure 5J), wherein the soft keyboard is located in a second area of the touch screen that is separate from the first area (e.g., keyboard 616, Figure 5J). In some embodiments, the expanded insertion marker is contracted (714) from the second size to the first size if finger contact with the touch screen display is broken (e.g., insertion marker 656, Figure 5K). In some embodiments, the contracting includes an animation of the expanded insertion marker 657 shrinking into the insertion marker 656 at the second location. In some embodiments, the expanded portion 650 of the graphics is contracted if finger contact with the touch screen display is no longer detected for a predetermined time. A graphical user interface on a portable electronic device with a touch screen display comprises an insertion marker and graphics. In response to detecting a finger contact 648 with the touch screen display, the insertion marker is expanded from a first size 656 to a second size 657, and a portion 650 of the graphics is expanded. In response to detecting movement of the finger contact on the touch screen display, the expanded insertion marker is moved in accordance with the detected movement of the finger contact from a first location 657-1 in the graphics to a second location 657-2 in the graphics. Additional description of insertion marker positioning can be found in U.S. Patent Application No. 11/553,436 , "Method, System, And Graphical User Interface For Positioning An Insertion Marker In A Touch Screen Display," filed October 26, 2006, the content of which is hereby incorporated by reference. Additional description of instant messaging on portable electronic devices can be found in U.S. Patent Application No. 60/883,819 , "Portable Electronic Device For Instant Messaging," filed January 7, 2007, the content of which is hereby incorporated by reference. 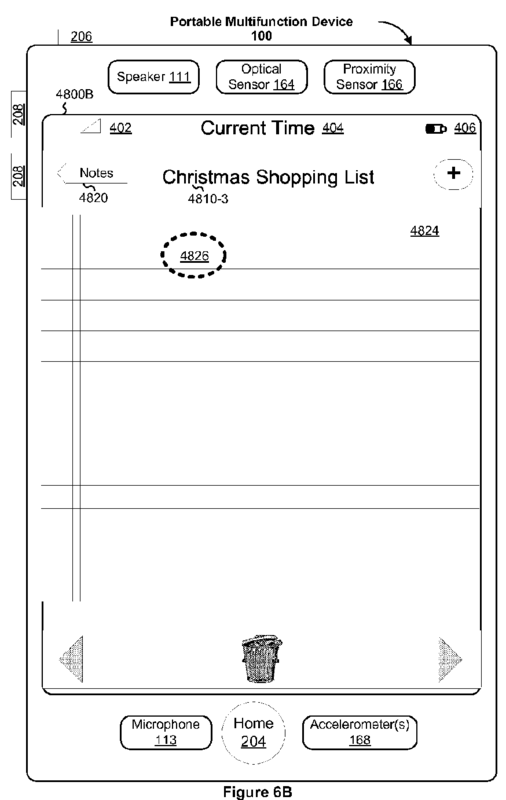 Additional information icon 4814 that when activated (e.g., by a finger tap on the icon) initiates transition to the corresponding note (e.g., UI 4800B, Figure 6B). In some embodiments, detection of a user gesture 4816 anywhere in a row corresponding to a note initiates transition to the corresponding note (e.g., UI 4800B, Figure 6B). A notepad 4824 for displaying text. In some embodiments, detection of a user gesture 4826 anywhere on the notepad 4824 initiates display of a contextual keyboard (e.g., UI 4800C, Figure 6C) for entering text in the notepad 4824. In some embodiments, when a contextual keyboard is displayed, detection of a user gesture on text in the notepad 4824 initiates display of an insertion point magnifier 4830, as described above with respect to Figures 5I-5K. In some embodiments, word suggestion techniques and user interfaces are used to make text entry easier. In some embodiments, a recommended word is put in the space bar (e.g., the recommended word "dinner" is in the space bar in Figure 5J) and detecting user contact with the space bar initiates acceptance of the recommended word. Additional description of word suggestion can be found in U.S. Patent Application No. 11/620,641 , "Method And System For Providing Word Recommendations For Text Input," filed January 5, 2007, and U.S. Patent Application No. 11/620,642 , "Method, System, And Graphical User Interface For Providing Word Recommendations," filed January 5, 2007, the contents of which are hereby incorporated by reference. the contracting includes an animation of the expanded insertion marker and the expanded portion of the graphics shrinking into the insertion marker at the second location. detecting movement of the finger contact on the touch screen display; and moving the expanded insertion marker in accordance with the detected movement of the finger contact from the first location to a second location in the graphics. 3. The method of embodiment 2, wherein the insertion marker is a cursor, insertion bar, insertion point, or pointer. 4. The method of embodiment 2, wherein the graphics comprise text. 5. The method of embodiment 2, wherein the portion of the graphics that is expanded includes the insertion marker and adjacent graphics. 6. The method of embodiment 2, wherein after the insertion point and the portion of the graphics are expanded, graphics are displayed that include the insertion marker and adjacent graphics at the original size and at the expanded size. 7. The method of embodiment 2, wherein the portion of the graphics that is expanded changes as the insertion marker moves from the first location to the second location. 8. The method of embodiment 7, wherein the portion of the graphics that is expanded is displayed in a circle. 9. The method of embodiment 7, wherein the portion of the graphics that is expanded is displayed in a predefined shape. 10. The method of embodiment 7, wherein the expanded insertion marker is within the circle. 11. The method of embodiment 2, wherein the location of the finger contact is proximate to the location of the insertion marker. 12. The method of embodiment 2, wherein the location of the finger contact is anywhere within a text entry area. 13. The method of embodiment 2, the detected movement of the finger contact has a horizontal component on the touch screen display and a vertical component on the touch screen display; and moving the expanded insertion marker in accordance with the detected movement of the finger contact includes moving the expanded insertion marker and the expanded portion of the graphics in accordance with only the horizontal component of motion of the finger contact when the finger contact moves outside a text entry area without breaking contact. 14. The method of embodiment 2, wherein moving the expanded insertion marker in accordance with the detected movement of the finger contact includes moving the expanded insertion marker in a first area of the touch screen that includes characters entered using a soft keyboard, wherein the soft keyboard is located in a second area of the touch screen that is separate from the first area. 15. The method of embodiment 2, including contracting the expanded insertion marker from the second size to the first size if finger contact with the touch screen display is broken. 16. The method of embodiment 15, wherein the contracting includes an animation of the expanded insertion marker shrinking into the insertion marker at the second location. 17. The method of embodiment 2, including contracting the expanded portion of the graphics if finger contact with the touch screen display is no longer detected for a predetermined time. in response to detecting movement of the finger contact on the touch screen display, the expanded insertion marker is moved in accordance with the detected movement of the finger contact from a first location in the graphics to a second location in the graphics. instructions for moving the expanded insertion marker in accordance with the detected movement of the finger contact from the first location to a second location in the graphics. detect movement of the finger contact on the touch screen display; and move the expanded insertion marker in accordance with the detected movement of the finger contact from the first location to a second location in the graphics. insertion point magnifier (650) in accordance with the detected movement of the finger contact. The method of claim 1, wherein after the insertion point and the portion of the graphics are expanded, graphics are displayed that include the insertion marker and adjacent graphics at the original size and at the expanded size. The method of claims 1 or 2, wherein the portion of the graphics that is expanded is displayed in a predefined shape. The method of claims 1 to 3, wherein the detected movement of the finger contact has a horizontal component on the touch screen display and a vertical component on the touch screen display; and moving the expanded insertion marker (657-1, 657-2) and the insertion point magnifier (650) in accordance with the detected movement of the finger contact includes moving the expanded insertion marker (657-1, 657-2) and the insertion point magnifier (650) in accordance with only the horizontal component of motion of the finger contact when the finger contact moves outside a text entry area without breaking contact. The method of claims 1 to 4, wherein moving the expanded insertion marker in accordance with the detected movement of the finger contact includes expanded insertion marker (657-1, 657-2) and insertion point magnifier (650) in a first area of the touch screen (112) that includes characters entered using a soft keyboard, wherein the soft keyboard is located in a second area of the touch screen that is separate from the first area. The method of claims 1 to 5, including contracting the expanded insertion marker (657-1, 657-2) from the second size to the first size if finger contact with the touch screen display (112) is broken. The method of claim 6, wherein the contracting includes an animation of the expanded insertion marker (657-1, 657-2) shrinking into the insertion marker at the second location (648-2). A computer readable storage medium storing one or more programs, the one or more programs comprising instructions, which when executed by a portable electronic device (100) with a touch screen display (112), cause the device (100) to perform the method of any of claims 1-7.